Writer and creative director Pascoe’s long history with Mysterious Galaxy includes his career as an author and publisher with Ugly Town, writing Buffy the Vampire Slayer comics, and novelisations of Kim Possible episodes – all near and dear to my heart. Jim and Heidi have created a magical world where Bridgebelle is a productive member of her rabbit community, who also creates art from the mysterious cha, when not evading the predatory canines who seek to enslave the rabbits and gain control of their resources. A gorgeous and thrilling animal fable. 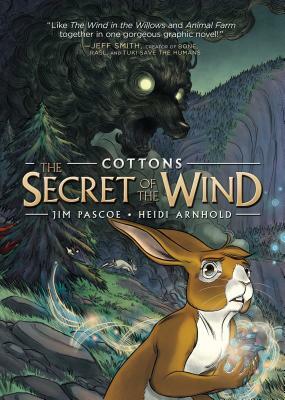 In Cottons, rabbits and foxes inhabit a world where magic, technology, and art are used as weapons of war. Written by Jim Pascoe, with bold illustrations from Heidi Arnhold. To her neighbors in the Vale of Industry, Bridgebelle is an ordinary rabbit. All day long, she toils at the carrot factory. After a hard day, she returns home to care for her ailing auntie. And whenever she's out, she's watchful of the murderous foxes who prey on her kind. But Bridgebelle is not ordinary—she's a rabbit with talents beyond her own understanding. Using cha, the mysterious fuel that powers her world, she can change everyday objects into thokchas—magical, transforming works of art. Bridgebelle makes thokchas because they're beautiful. But there are those in her world who want to harness her powers and turn her art into a weapon. Jim Pascoe is a writer, designer, and an award-winning creative director. His comics credits include Buffy the Vampire Slayer, Hellboy Animated, and the original series Undertown—which was originally published by TOKYOPOP, put out as a book-fair edition by Scholastic, and distributed by Universal Press Syndicate to over fifty newspapers worldwide. He lives in Los Angeles, where he drinks coffee, sleeps very little, and believes in magic. Heidi Arnhold is a graduate of the Savannah College of Art and Design whose published works have involved popular franchises like Star Trek, The Dark Crystal, and Fraggle Rock. She began working on Cottons with writer Jim Pascoe in 2010. The art in this book is powered by Heidi's love for visual storytelling, all rabbits, and kale smoothies. She currently resides in Atlanta with her husband, one adorable bunny, and a blender that makes kale smoothies.